London is a truly romantic city. There is just something about the street lights at dusk, the Royal history, and the stunning architecture, that just begs you to get lost. So, during our stay, we wanted to explore as much as possible and see some really interesting sights! We were staying at the Shangri-La at the Shard and found out that they organize a series of packaged offerings; one of which was the “Modern Couples Experience”. 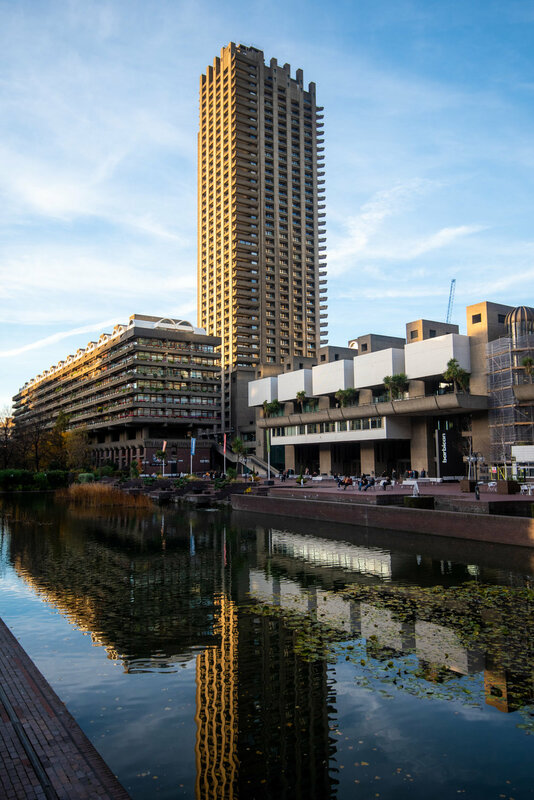 The experience was organized in partnership with the Barbican Centre, one of the city’s most iconic and artistic areas and would take us all around London, with a final stop at the Modern Couples exhibition at the Barbican Centre (a building we had been curious about for awhile). Overall, it made for a fun, romantic way to explore London and take in the exhibit. We were all in! I’ll admit I’m not usually a fan of organized packages and tours.They’re generally rushed, cramped, and boring. There’s never enough time in the areas I want, and too much time lingering in places I’m uninterested in. However, I found that the Modern Couples Experience made for a unique, lovely day that we were able to tailor to our own interests and do by ourselves. As a part of the package, the hotel gave us a walking map of the city which highlighted some of London’s most romantic sites. On top of tickets to the exhibit, the package contained two drinks at Gong (a bar located on the floor of our hotel) , breakfast for two at Ting, and a one night stay for two at Shangri-La. The package’s inclusive, yet adaptable design allowed for all the convenience of a structured excursion without the strict itinerary or inflexibility of a guided tour. After waking up in our room at the Shangri-La, we ventured to breakfast at TING, where we enjoyed a classic English breakfast for two. Both the one-night stay at the hotel and our morning meal were all included as a part of the Modern Couples Experience package, which made for a leisurely morning before kicking off the day. We then started our walking tour at Borough Market, which is located conveniently just around the corner from the hotel. Captivated by the market’s bright color, fresh produce, and drink selections, we might have lingered here a little longer than intended! However, that’s the beauty of this self-guided tour package; we were able to leisurely stroll through the area, eating and drinking our way through the market without feeling rushed or guilty. Next, we followed the map’s dictated route to see some of London’s most famous sites. A few of them included the iconic Millennium Bridge, St Paul’s Cathedral, Shakespeare’s Globe Theatre and so many other spots. The path eventually ended at the Barbican, where we excitedly entered the Modern Couples exhibit. Synthesizing the elements of both art and history, this exhibit explored the fascinating, devoted, and problematic relationships of many iconic figures. Just a few of the couples covered at the exhibit included Pablo Picasso and Dora Maar, Salvador Dali and Federico Garcia Lorca, as well as Frida Kahlo and Diego Rivera. Both shocking and sweetly romantic, it was easy to lose myself in the fascinating histories of these artists and their compelling relationships. After taking in the exhibit, we strolled back to the hotel. There, we enjoyed a couple of drinks at Gong, Shangri-La’s luxurious Asian-themed cocktail bar. The bar’s chill ambiance and creative drink options were the perfect way to wrap up the evening. Overall, the Modern Couples Experience made for an excellent, romantic day out. The exhibit runs from October 10th, 2018 until January 27th, 2019. However, even if you happen to visit London and stay at the hotel after the exhibit ends, you can talk to the hotel concierge for help organizing a similar route. From its gorgeous, iconic sites of St. Paul’s Cathedral and the Millenium Bridge, to the flavor and color of the Borough Market, this route made for a truly lovely day. The experience was romantic, fun and got us out and about in London!